Welcome to the general discussion for the anime series Kantai Collection -KanColle-. In order to ensure a proper discussion environment, please follow these additional guidelines. -Do not discuss anything related to the game, unless it is for references sake and/or answer a quick question regarding a very specific occurence in the anime. For furher discussion/inquiry about the game, the game thread is for such purpose. -Please avoid posting multiples pictures that has no direct connection to what has been going on in the anime. Please use the social group instead. -As a reminder, the game is currently boasting a huge cast of 147 characters (not including alternate forms), and as such, it is arguably not possible to show all of them. While the anime studio already stated there will be around 30-40 characters, they will show several characters at once, as giving focus to each of them would disrupt the flow of the series. As such, please do not make any comment about certain characters not being there, or having very minimal screentime. -Finally, please do not start meta discussions and other subjects that are very loosely tied to the franchise: you are free to comment and explain few points that are directly related to what happened during the Pacific War, but you aren't allowed to derail the topic with discussion about WWII or anything that is remotely connected to the setup. For the same reason, do not start technical and ship discussions. Theses are needlessly lengthy and not really pertinent. Last edited by Klashikari; 2015-02-01 at 05:17. 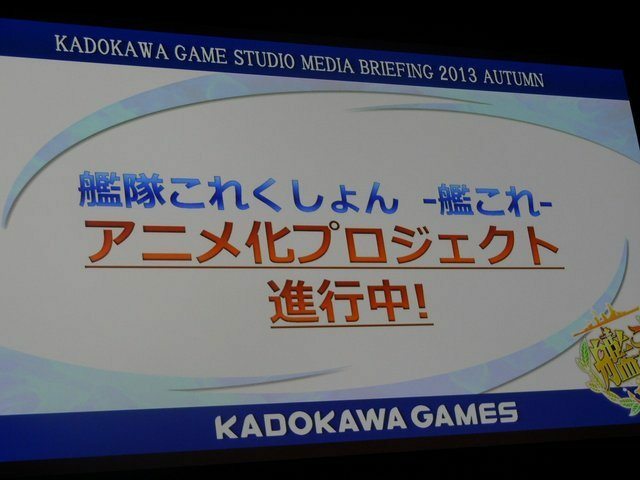 Kadokawa Games announces Kantai Collection (Kancolle) anime at the “KADOKAWA GAME STUDIO MEDIA BRIEFING 2013 AUTUMN" event, along with a PS Vita game. Right. So information about the anime. - Will be mainly about Fubuki's growth. The flow of information never stops! New ships I guess, if these two below Fubuki is of an any indication. There's a question I'd like to ask my fellow anime fans, and this thread seems like a good one to ask it in. It's a bit disconcerting for a big anime fan like myself to know virtually nothing about something that appears to be the "next big thing" in anime. So any info that others can provide here would be much-appreciated. Kantai Collection is basically a browser game involving moe anthropomorphic version of naval warships from the Pacific War (and pretty much like Arpeggio, since they are "she", there are only girls in there... also for "business/practical" reasons). The whole point of the game is to manage your fleet as the admiral, by making expeditions/sorties and tune your ships with modernization and what not. You don't really have any active role during battle, as the combat mechanics are determined by your ships stats, and a lot of RNG at work. Suffice to say, the fleet composition, supply and equipments are very important, which you have full control of it before sortie. The primary reason for such popularity is that you have a plethora of seiyuu at work (mainly: Toyama Nao, Fujita Saki, Ayane Sakura, Iguchi Yuuka, etc), as well as lots of colorful characters that are hardly clones of each other. The staff also replicated some real stuff from the pacific war, even putting nods/jokes about that so it also attract military (or rather navy) otaku. quick example: Kaga, the 1st division aircraft carrier, doesn't like Shoukaku and Zuikaku from the 5th division, because these 2 weren't present during the Battle of Midway, in which Kaga, Akagi, Souryuu and Hiryuu sunk. Afterwards, the 5th division inherited the 1st division title. Another important point is that, should a ship is sunk, similarly to Fire Emblem series, you -cannot- retrieve her, and there is no way to revive them. Of course, you can craft/drop another copy of the fallen kanmusu (assuming they are available with such means), but you will have to grind them from scratch (be it level or equipement). Due to their personalities and that important matter, the game naturally make players care about their ships. Adding the fact the game is easy to grasp (easy control without the need of babysitting a smartphone every 5-10 minutes) along with a big collection to get with little to no paid content requirement, you have a very successful formula. It pretty much is the current major trend to the point it reaches Touhou's popularity, hence why you see it nearly everywhere. For instance, Googling a japanese warship will most likely give you a kancolle image result pretty quickly. The funniest part would be the aftermath of c85, as there are just tons of kancolle centred doujinshi planned for it, most notably on Shimakaze. Last edited by Klashikari; 2015-01-14 at 19:54. 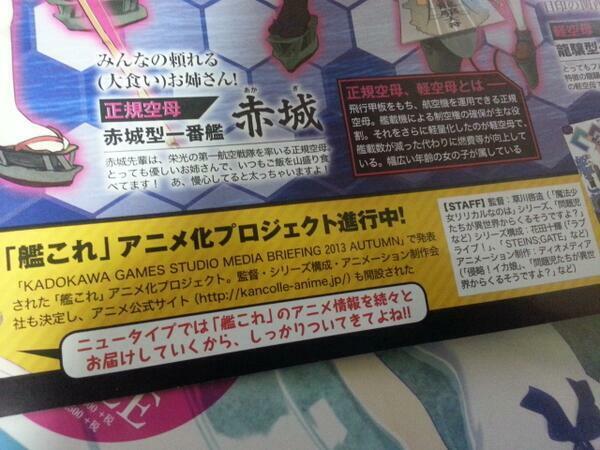 So we have Nanoha, Love Live, and Steins;Gate alumna on the production team? That's... a pleasant surprise. The morning sun is shining brightly, so wake up! And press forth, we shall, just you wait and see! "It's going to be alright, so let's go home"
Blow them all up, with the force of our will! Take a peek into our hearts, and you'll see! And resonate, we shall, as an entire fleet! Asa no hikari mabushikute, Wake up! Mae ni susumu no, miteiteyo! Ima negai kometa ichigeki, hazeta! Kojiakeru no, mite ite yo! Ima inori kometa ichigeki, hibike! Compared to my impressions with the camrip, it was pretty much the same: good balance and the likes. In general, I would say the CGI were way more noticeable, but not to the point of being obnoxious. They sure permuted several sequences in 2D then in 3D, but it isn't as bothering as how it was in Love Live. Similarly to LoweGear, the scores used are pretty good with nice orchestral notes. Quite fitting for the battle sequences. I'm however surprised they didn't put some game rearrange for sake of reference, but who knows if they will do that later. I will probably make a list of the characters shown onscreen with links to their game profile, as I assume some people will have hard time to figure who is who as well as their class. Last edited by Klashikari; 2015-01-14 at 13:56. For someone who doesn't know the game (and doesn't want to, since it's the kind of game I completely dislike - and not for the character designs or the concept) it looked entertaining. Its massive cast is going to be its biggest problem though, even if the studio said the focus is on a smaller set of characters. Done. We have 42 characters (regardless if they have some lines or not), and that's not counting the enemies. I will probably add a seperate list for that. Last edited by Klashikari; 2015-01-07 at 13:06. - Take a shot every time "Poi" is mentioned. Oh wait, we'll end up with destroyed livers after this episode alone. Yay it's my abyssal waifu Wo-chan! Episode one is simply, great from the very beginning, I didn't expect Yoshiko Sakakibara to narrate the prologue and if she stays in the remaining episodes, I'm gonna put some voice fangirling mode in her. The cast is certainly large at it is, it gives me heavy Sengoku Collection vibes, with the only difference that in here, the plot is linear and has battleships anthropomorphized as girls. I'm already familiar with enough characters just by looking their names and character designs as I haven't played the game yet (I did look numerous fanarts of them though). Animation was certainly top-quality and the setting is interesting as if it felt like we're during in alternate universe 1940s where World War II didn't happen. Will keep watching it, seeing I really loved the mechanic transformation scenes in the second half, I feel curious to see the opening theme starting next week. I'll scrap yall for fuel, steel and ammo if you do.